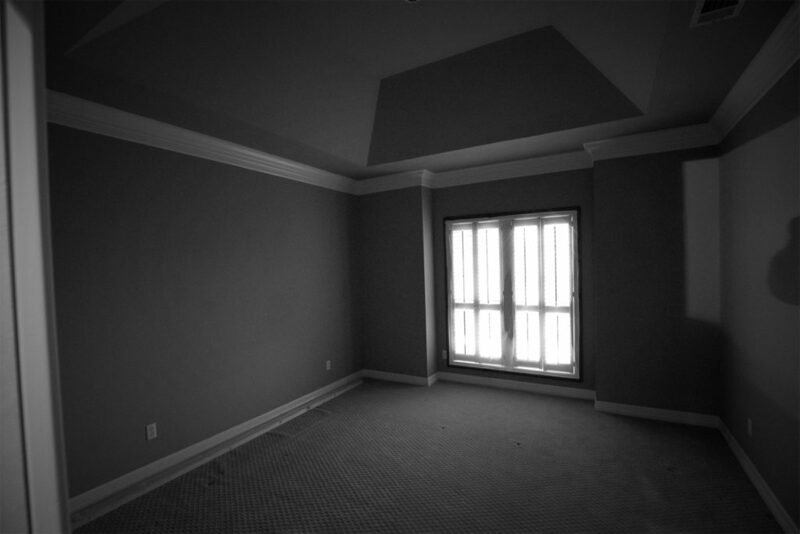 The clients were empty nesters whose grown children already had families of their own and would come to stay on occasion. The closed off kitchen was not functional for entertaining their growing family. 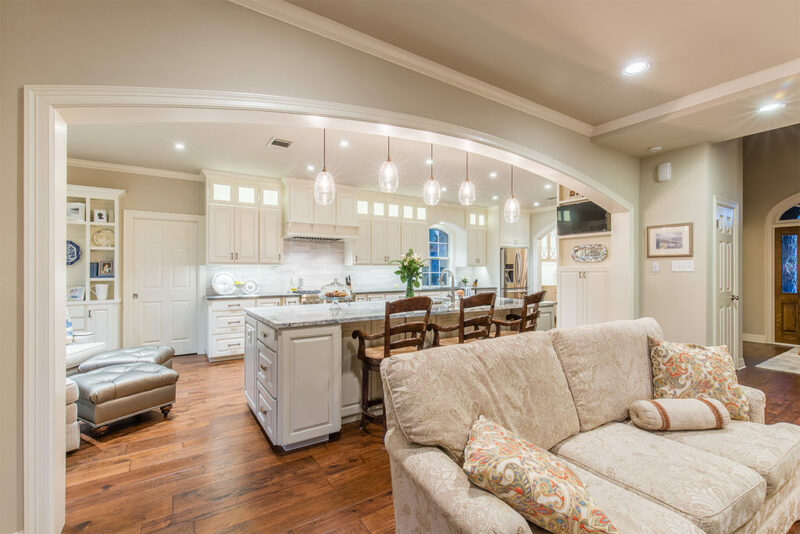 An open concept kitchen where the wife could interact with family and guests in the adjacent living and dining rooms while cooking was their top request. They wanted to maintain the same amount of cabinet storage with this new layout. The husband desired a sitting area within the kitchen proper where he could watch tv while talking with his spouse during day to day life. There was no need for a separate breakfast table so the clients desired bar seating where they could enjoy casual meals between the two of them. By eliminating the walk-in pantry and its wasted floor area in favor of adjustable pull out pantry cabinetry, taking inventory of the clients kitchen items, and planning cabinetry layouts specifically around those items, the client now has even more storage than she previously had, all with the wide open layout she desired. The kitchen was closed off to the adjacent rooms and the formal dining room was only visited on special occasions and holidays. Now one contiguous space divided by large arched cased openings, the spaces flow and invite you into what was once secluded kitchen and dining rooms. Proper work triangles make sure you aren’t traversing across the kitchen every minute. The island has a prep sink, cutting boards and a custom “Kapoosh” knife block pull-out, and a trash pull-out for food prep directly adjacent to cooking at the new 36” range. The island also serves as the focal point for entertaining guests as it houses the liquor storage drawers, wine captain, ice maker, and filtered water supply necessary to facilitate beverage needs. General lighting is addressed elegantly using WAC Lighting’s new 2” square trim LED’s, while task lighting is achieved via under cabinet LED tape lighting. A custom island pendant created by separating a 5-cluster single pendant and spreading it out across a custom valance created lighting that covered the entire bar area. An old world style “globe” wood chandelier in the dining area with decorative LED edison bulbs gives off a warm and inviting light. The existing kitchen with its 1980’s honey colored stained cabinets, black appliances, and builder-grade granite was in desperate need of an update. The new design not only functions better as one continuos space, but the white perimeter cabinets with contrasting cemento grey counters and LED lighting really brighten the space. Contrasting grey cabinets, high gloss Azurite granite countertop, cup pull hardware, and all drawers on the island created the feel of furniture on this entertaining island. The wood-grain-like natural stone backsplash tile laid in a 2/3rds broken bond pattern plays to the linear feel of the widened galley layout, and the rich engineered wood flooring really brings warmth to this traditional kitchen. 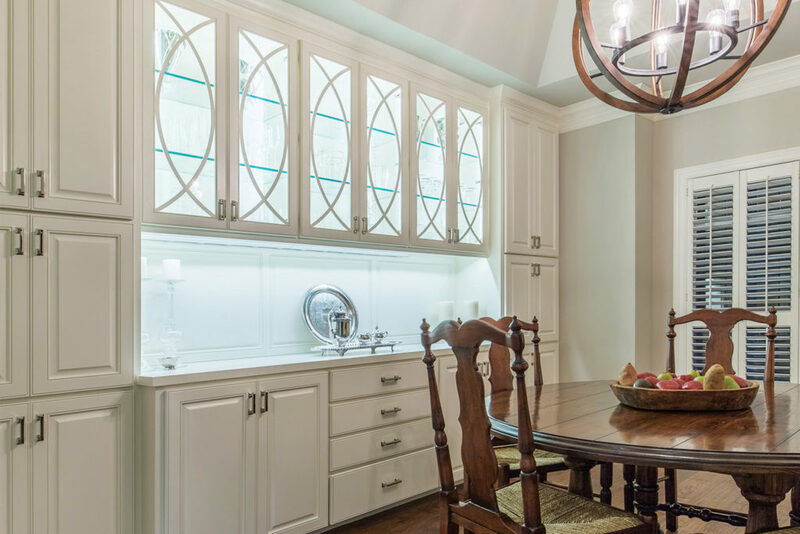 From the custom arched trim on the cased openings that divide the spaces, to the pacific silver cloth lined cabinetry in the dining room, superior craftsmanship is the highlight of this project. Custom cabinetry throughout has no visible seams or shoe mold and suits all the clients’ storage needs, as well as the glass dining room display cabinets whose swooping half circle mutton patterns compliment the spherical chandelier. Under cabinet plug strips and LED tape lighting mounted vertically to the back side of display cabinet face frames lights china without being seen or creating hot spots. Cabinetry details like a built-in paper towel holder in the island, pull outs for things like cutting boards and a custom knife block, an appliance garage pull out for the toaster and coffee maker, as well as spice pull outs mirroring the range are all key features of this new functional design and layout. In order to create the 18’ wide custom arch cased openings, segmented pieces of the original trim were installed to create the radius and bondo was artistically applied and sanded to create one continuous curve with no seams or visible segments. In remodels surprises and overcoming difficult obstacles is the name of the game, and we have become accustomed mastering that. It’s almost something we look forward to. 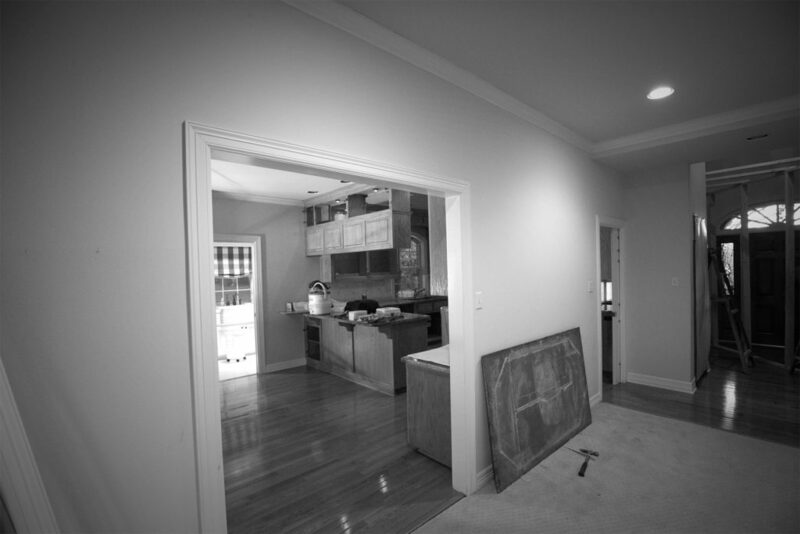 This project was centered around removing the structural wall between the kitchen and living room. First, a 4” sanitary drain line coming down from the floor above that was uncovered in demolition and had to be rerouted under a girder beam. This would have left it exposed in our space, so the design was manipulated to allow the drain line to come out of the ceiling by deepening the cabinet that houses the microwave and coffee maker. Second, removing this structural wall required a new W10x30 steel beam be installed to span the 18’ and be supported by two new 3-1/2” steel columns at either end. This beam had to be installed while keeping the second floor framing from moving more than a 1/4” at any point or the exterior brick supported over the roof would collapse. Finally, in removing the existing wood flooring, we found plywood subfloor laid over the top of a slab on grade that was out of level by up to 1-1/2”. This 3/4” subfloor allowed us to shim varying sizes of plywood from 0 to 1-1/2” and end up with a level floor to set our cabinets perfectly with no shoe mold.